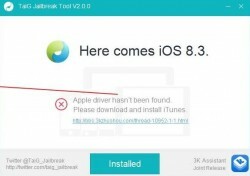 While most are jubilant about being granted a free jailbreak in which they can use that’s fully untethered finally, others are upset about the amount of bugs within the iOS 8.3/iOS 8.4 TaiG jailbreak and feel the release was rushed. Some hacking experts think TaiG definitely rushed the release and only had money in their minds when making it available to the public. While there certainly are a few bugs within the jailbreak ecosystem, there’s also one large issue before we get that far. If you haven’t had the jailbreak working yet because you are stuck with the “Apple driver hasn’t been found” error, you can learn how to fix that after the jump. Download the 64bit version of iTunes from this link . Download the 64bit iTunes drivers, namely iTunesDriver64_0205.exe for Windows here . Download the latest version of TaiG 2.2 from here . Launch the TaiG tool and follow the “How to jailbreak iOS 8.4 on iPhone 6, 6 Plus, 5s with TaiG 2.2 ” guide.